About five years ago, one of the pastors at our church spoke about the importance of creating a sense of team and vision within your own family. One of the ways he’d done this with his family was by creating a Family Creed – a list of principals to live by, sort of a mission statement to help define what your family is all about. As he shared his Family Creed, I feverishly took notes. Our daughter was about six at the time, our son was about four, and there were days during those years I felt like I spent half my time repeating myself, trying to teach the kids and discipline them. The creed sounded like a great way to focus and get everyone on the same page. Heikkas let others go first. Heikkas leave no one behind. Heikkas act like gentlemen and ladies. 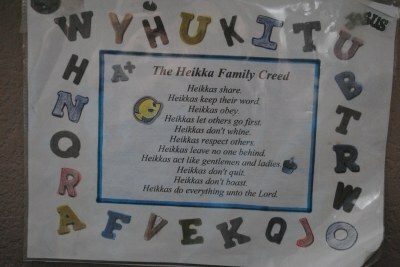 Heikkas do everything as if unto the Lord. When Mike and I shared it with the kids, it gave us a new framework to talk about the importance of things like letting others go first and not leaving anyone behind, like never quitting and always respecting others. We made copies and taped the creed to each of their bedroom doors.Sometimes the tape would lose its stick and the creeds would fall to the floor, but we’d always put them back up.After a while, our kids even had the creed memorized. They could proudly recite it on their own. At eight and ten years old now (actually, almost nine and eleven), our kids need less reminding. And, I admit, we haven’t read or even talked about our Family Creed in a while. In fact, the copy on my son’s door fell off several weeks ago. Instead of taping it back up, I set it on his dresser and made a mental note to get to it later. I didn’t think he had noticed that it had fallen. He had taken it off his dresser and tacked it to his wall, all on his own. It was still important to him. And it should be important to me, too. I might’ve thought it wasn’t needed as much anymore. 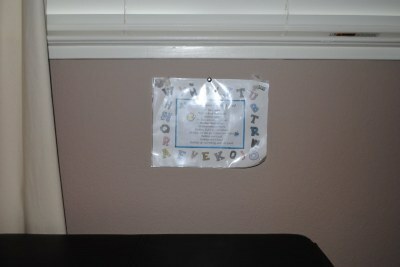 But the fact that he put it on his wall made me take a fresh look at the principals and vision we share as a family. And those aren’t something any of us should outgrow. I loved the reminder my son gave me, and I also loved the fact that he used a push pin instead of tape to put the creed on his wall. « What do you want to talk about? What a great idea. I have heard of it, but we have never put done it. It's so great when our kids actually "get" it and own things for themselves.These are the little seeds we as parents plant.Have a blessed day. Wow that's a really neat idea. Maybe once my son gets a little older we will do that too. Thanks for sharing! That is really a great idea…my heart sank a little when I thought about how you said at ages 4-6 you were doing a lot of "repeating" and discipline. My littles are 1 and 2 1/2 and that feels like that's all I do some days, already… so that means a really long time. Coming up with something like this might be very beneficial to introduce (not yet), one day soon. Love it. We have talked of doing this, but haven't yet- thanks for the reminder. I've never seen something like that but I have to tell you that I love it.Thanks for sharing it.Have a wonderful week.PS: What is the topic for Thursday I'm lost,ha. Sorry, I find the topic. Thanks for chiming in everone!Bevy, hang in there. That part gets easier as they get older. :)Annie, glad you found the link! That is a great idea.I think it's so sweet that it's still special to your son. Wow, that is a really great post! I wish I would have read this like 15 years ago. :)GREAT ideas! Actually, I bet it's something that could be implemented at any point in raising kids. Thanks for sharing, it was really great info! This is such a wonderful idea..My kids are teeneagers now but this still appies in so many ways. Genny, thank you for sharing your family's creed. As your daughter's former cheer coach, I can attest to the fact that your beautiful daughter absolutely lived by that creed in everything she did and the way she treated everyone else on her squad, including me. Keep up the great work. We call it our Family Mission Statement. We worked on it together & it has been a wonderful thing to reflect on as a family. It's very cool to see that other families have one too!